– as an unparalleled means of totally metamorphosing individual human beings – theatre, pantomime, but also European painting, architectural space and classical music blend here into a unique synthesis, all in the spirit of the "Gesamtkunstwerk". 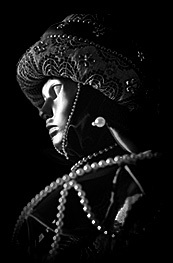 Following several exhibitions of photography enriched with happenings in her own costume creations, and particularly after the series of interactive Venetian parades at the Baltic Sea in Gdynia-Orłowo, Poland, the disguised figures had begun to take possession of their author’s imagination to such an extent that she was not only forced to find additional space for their acting, but also to expand their means of expression by incorporating elements of ballet, dance and, above all, of pantomime. The Theatre is gradually establishing its own repertoire – from stage etudes, through chamber concerts arranged in form of a spectacle, going on to regular productions involving music, choreography and stage movement. In order to fulfil its goal, it relies first of all on classical music, starting with Baroque, through nineteen century Italian or French opera, and continuing with the music of the modern period. Being itself a hybrid, the Theatre of Music and the Mask "VENEZIA" takes its position right at the point where genres and styles intersect attempting to integrate in its endeavours elements of "living pictures", trance, pantomime, classical dance and ballet. In so doing, it also tries to proactively explore new forms of expression: the open-air theatre, the street theatre, and especially the Dance Theatre. The recent exchange of thoughts and experiences with the Polish Dance Theater of Poznań, headed by Ewa Wycichowska, has become an immensely important influence on its efforts. In the main photograph Beata Wielopolska's figures are acting within the stage design for "Casanova" of Tadeusz Smolicki. The performance directed by Jacek Bunsch premiered on 20th July 2007 on the XIIth Summer Stage in Gdynia-Orłowo, Poland (courtesy of both authors).